A journal can be a powerful tool for self awareness, productivity, and self improvement if you use it the right way. 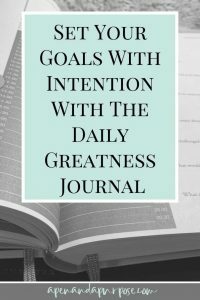 In this review, I’ll tell you about the Daily Greatness Journal and how it can help you. The fact is it makes sense to sometimes feel like you have nothing to write, especially when first starting out with your journaling practice. That’s where a guided journal comes in. A guided journal helps you by giving you prompts to follow on a daily basis. You don’t have to think about what to write because you are instead answering questions. 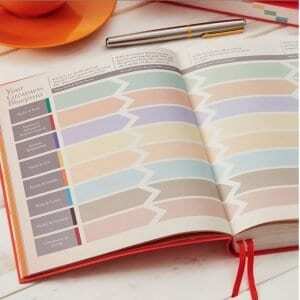 More, a guided journal directs you toward reaching the goals you set out to reach with your journal. I’m excited to share with you a journal that will help you create a daily writing practice that will actually make a difference in your life. This is a journal for those who wish to be mindful of how they spend their time and the action steps they take to reach their goals. I’ve spent a lot of time trying to find a journal that has prompts that are meaningful and varied. I’ve used a lot of different journals at this point and often find myself getting bored and moving on. But there is something really great about having a journal “for consciously creating your day.” That’s my jam! As someone who is easily distractible, I need to have a way to plan for what I’d like my day to entail. Although I do this in my bullet journal, I also like to use the Daily Greatness Journal for questions and prompts to help me to figure out what those intentions are. Face your fears and get it done! For the rest of this post, I will focus on the Daily Greatness Journal Original yearly version. 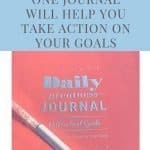 What’s In the Daily Greatness Journal (Original)? Reflection pages: I don’t know what else to call these but in the beginning of the journal there are pages for you to work through things including looking at forgiveness, your achievements, values, dreams, and goals. The pages have you come up with a personal mission statement as well as a why statement which I think is pretty cool. Each of these areas have guided questions leading you to develop a pretty specific goal to act upon. The journal reminds you several times to refer back to this. Weekly check ins to help you look over your week and become more self aware. Reflection helps you to determine what is and is not working for you and to make positive adjustments in your life. Weekly planner: On Sundays you plan your coming week by figuring out what goals you’d like to accomplish in the following week. The journal helps you to look at what you did well in the past week as well as areas you could improve. Then you choose 4 goals to focus on in the coming week along with actions you’ll take to get there. I love how the journal gets you to think about your intentions and goals all the time. 90 day check in: Every 90 days you review how things went. There are a series of questions to answer to help you to celebrate achievements and plan your goals for the next 90 days. I love that this helps the journal align well with the 12 Week Year. 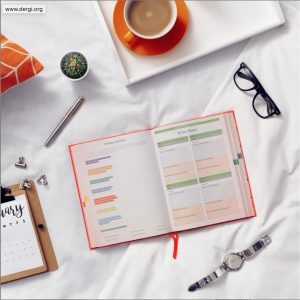 A Yearly review helps you to reflect on the previous year, looking at what you’ve accomplished toward your goals and what you’ve learned in the past year. 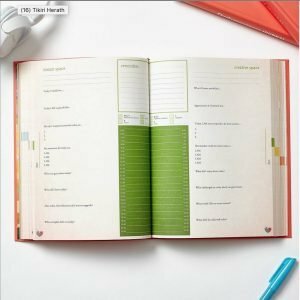 Daily pages include checkboxes for the daily steps, reminders/to dos, a schedule, and guided questions. What’s cool is they questions are different each day and fall under different categories like ideas, thoughts, dreams open, and invention. There are different questions under different categories. They often include questions about what you intend to do during the day as well as affirmations to get you motivated to do them. The original yearly journal has over 400 pages but is lightweight. It reminds me of the size and weight of a paperback cookbook. The cover is a bit thicker than paperback, but still flexible. It’s a pretty nice book. I love the bright orange color and the pages are also fun and colorful. The journal is undated which means you can start it at any time and not really skip pages if you stop using it for awhile. The only time I found this not to be the case would be times when I stopped using it in the middle of the week. I would then skip the rest of the week to start a new week to keep up with the reflection pages. The business version from 2018 is currently on sale for 50% off. According to the website, it is entirely undated with the exception of the yearly overview at the beginning. What an awesome deal since you can just use stickers and change the dates! As mentioned above, I have several versions of the journal. My favorite one is the original yearly version, which is the one I recommend you purchase by clicking here. I like the guided questions each day. There are not a ton, so it doesn’t take forever to complete them. In fact, you only do half in the morning and half at night. I like that they are not the same questions each day, although they do repeat in the book. It is colorful and fun. I like the thoughtful beginning pages, especially the method they use for goal setting. It’s great that the book has you think about your goals in different areas of your life. Then, each week you reflect on actions you will take during the following week to reach those goals. Brilliant. I like the look and feel of the book and all the built in reflection. I love that the schedule is not a big part of the journal since it is just in the middle of the page. Since I do not use a schedule, it’s not space that I typically use. Having it smallish and in the middle makes it useful but also welcomes other uses such as scheduling batches of work. The paper is thin and will not hold fountain pen ink. Regular pens are fine with little ghosting. Being a paper snob, I’m not excited about the paper. It is pretty similar to regular printer paper. But it has to be since it is a large journal. Of course, for me this doesn’t matter that much since I use this journal more as a tool than as my daily planner. Another thing that is hard for me is I’m super forgetful so find it hard sometimes to remember to go back in the evening to reflect on the day. It’s such an important thing to do though. Making this a habit will cause you to make big changes in your life. If you’re looking for a guided journal to help you to get clarity around your goals and to reflect on each day, I recommend you click here and purchase the Daily Greatness Journal. The journal will help you to develop a practice of mindful conscious living so that you can be super intentional about how you spend your time. This journal will help you really think about who you are as a person and who you want to be. Questions such as “What am I happy about write now?” “What fears are holding me back and how can I overcome them?” and “Where can I be a better leader?” are excellent ways to get you thinking about your life differently instead of getting stuck in the daily grind.